Experienced teachers in the northeast were surveyed in September by education firm TutaPoint. The survey, which took place from September 18 to September 25, 2014 included 25 questions. Results from this survey are listed below in categories. Teachers included in this survey were very experienced; 91% having over 10 years of teaching experience, the remaining 9% having at least five years of experience. The respondents were high school teachers; 50.5% teach science, 37% teach math. The majority of experienced teachers who responded to the survey believe that high school students should be spending at least five to six hours per week doing homework outside of school. According to 24.6% of the teachers, students should be spending at least nine hours per week doing homework. How much learning should be done at home versus at school? According to 77.6% the professionals, at least 30% of learning should be occurring at home. In fact, 15.6% of the experienced teachers believe that at least 50% of learning should happen outside of school. While 42.6% of respondents believe it is too early to tell whether the Common Core Standards are having a positive or negative impact on a student’s learning. Of those experienced teachers that do have an opinion, the news isn’t good: 64.7% believe that the Common Core Standards are having a negative impact on students, leaving 35.3% of teachers that believe the Common Core is having a positive impact on student learning. Do the parents understand? Absolutely not; according to these long-term teachers, parents do not understand what the Common Core is all about. The survey reported that 95.5% of respondents believed that parents do not understand what the Common Core is; 4.4% of the respondents said they weren’t sure leaving 0% of respondents that believe parents understand the Common Core. Early to rise: 67.3% of teachers reported starting the day before 5:30am with 30.3% getting up before 5am. Starting the day so early results in 66.3% of the respondents drinking caffeinated beverages. 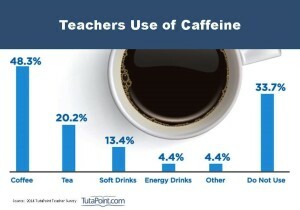 Coffee leads the poll with 55.8% of the teachers that drink caffeine, second is tea with 23.4% and 15.6% choosing soft drinks. Energy drinks accounted for 5%. These educators also do a considerable amount of schoolwork outside of work; 53.7% of teachers reported doing at least 11 hours of work per week outside of the regular school day. Almost 9% report doing more than 20 hours per week outside of school. Unfortunately, just 28% of teachers surveyed believe that they are fairly compensated for the job that they do, with 60.6% believing they are not fairly compensated and 10% unsure. Of those listed, the number one challenge to teaching is large class sizes (20.2%). The following were also listed as challenges: school administration (19.1%), standardized testing (17.9%), budget constraints (11.2%), Common Core Standards (8.9%). As for parents? Only 14.6% of the experienced respondents indicated that parents are more of an ally in the education process now than when they started teaching and 59.5% believed that parents are actually less of an ally. 25.8% of respondents were unsure. Do the challenges give these teachers second thoughts about a career in teaching? According to the respondents, just 39.3% would choose to be a teacher again and 25.8% would not, leaving 34.8% unsure about their decision. 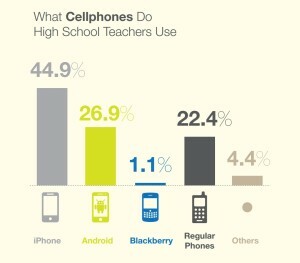 Smartphones in the classroom? You bet, 59.5% of respondents indicated that they allow their students to bring in their smartphones. Teachers are also communicating with their students electronically using the following methods: via email (75.2%), through a website (71.9%), using Google Docs (32.5%), by text message (17.9%), using Facebook (3.3%). Teachers prefer using the iPhone as their smartphone with 44.9% of respondents indicating they use one versus 26.9% that use an Android phone. Blackberry and Windows phones were the clear losers with just 1.1% and 0% usage respectively. Non-smartphone using teachers accounted for 24.6% of respondents; with 22.4% indicating they use a regular (non-smart) cellphone and 2.2% indicating they do not have a cell phone. Teachers overwhelmingly reported that the majority of their time is spent teaching students that are underperforming (64%) and 2.2% of teachers indicating that they teach to the highest performing students. Just 15.7% of teachers indicating they are able to teach across all levels of students and 17.9% of teachers indicating they teach to the middle. Overwhelmingly experienced teachers say they recommend struggling students use a tutor (89.8%). Teachers indicate the most effective ways for a struggling student to turn their failing grades around are: after school help, regular tutoring, peer help and parental help (in that order).